In a helicopter, an autorotation is a descending maneuver where the engine is disengaged from the main rotor system and the rotor blades are driven solely by the upward flow of air through the rotor. In other words, the engine is no longer supplying power to the main rotor. The most common reason for an autorotation is an engine failure, but autorotations can also be performed in the event of a complete tail rotor failure, since there is virtually no torque produced in an autorotation. If altitude permits, they can also be used to recover from settling with power. If the engine fails, the freewheeling unit automatically disengages the engine from the main rotor allowing the main rotor to rotate freely. Essentially, the freewheeling unit disengages anytime the engine r.p.m. is less than the rotor r.p.m. At the instant of engine failure, the main rotor blades are producing lift and thrust from their angle of attack and velocity. By immediately lowering collective pitch, which must be done in case of an engine failure, lift and drag are reduced, and the helicopter begins an immediate descent, thus producing an upward flow of air through the rotor system. This upward flow of air through the rotor provides sufficient thrust to maintain rotor r.p.m. throughout the descent. Since the tail rotor is driven by the main rotor transmission during autorotation, heading control is maintained as in normal flight. Several factors affect the rate of descent in autorotation; density altitude, gross weight, rotor r.p.m., and airspeed. Your primary control of the rate of descent is airspeed. Higher or lower airspeeds are obtained with the cyclic pitch control just as in normal flight. In theory, you have a choice in the angle of descent varying from a vertical descent to maximum range, which is the minimum angle of descent. Rate of descent is high at zero airspeed and decreases to a minimum at approximately 50 to 60 knots, depending upon the particular helicopter and the factors just mentioned. As the airspeed increases beyond that which gives minimum rate of descent, the rate of descent increases again. When landing from an autorotation, the energy stored in the rotating blades is used to decrease the rate of descent and make a soft landing. A greater amount of rotor energy is required to stop a helicopter with a high rate of descent than is required to stop a helicopter that is descending more slowly. Therefore, autorotative descents at very low or very high airspeeds are more critical than those performed at the minimum rate of descent airspeed. Each type of helicopter has a specific airspeed at which a power-off glide is most efficient. The best airspeed is the one which combines the greatest glide range with the slowest rate of descent. The specific airspeed is somewhat different for each type of helicopter, yet certain factors affect all configurations in the same manner. The specific airspeed for autorotations is established for each type of helicopter on the basis of average weather and wind conditions and normal loading. When the helicopter is operated with heavy loads in high density altitude or gusty wind conditions, best performance is achieved from a slightly increased airspeed in the descent. For autorotations at low density altitude and light loading, best performance is achieved from a slight decrease in normal airspeed. Following this general procedure of fitting airspeed to existing conditions, you can achieve approximately the same glide angle in any set of circumstances and estimate the touchdown point. When making turns during an autorotation, generally use cyclic control only. Use of antitorque pedals to assist or speed the turn causes loss of airspeed and downward pitching of the nose. When an autorotation is initiated, sufficient antitorque pedal pressure should be used to maintain straight flight and prevent yawing. This pressure should not be changed to assist the turn. Use collective pitch control to manage rotor r.p.m. If rotor r.p.m. builds too high during an autorotation, raise the collective sufficiently to decrease r.p.m. back to the normal operating range. If the r.p.m. begins decreasing, you have to again lower the collective. Always keep the rotor r.p.m. within the established range for your helicopter. During a turn, rotor r.p.m. increases due to the increased back cyclic control pressure, which induces a greater airflow through the rotor system. The r.p.m. builds rapidly and can easily exceed the maximum limit if not controlled by use of collective. The tighter the turn and the heavier the gross weight, the higher the r.p.m. To initiate an autorotation, other than in a low hover, lower the collective pitch control. This holds true whether performing a practice autorotation or in the event of an in-flight engine failure. This reduces the pitch of the main rotor blades and allows them to continue turning at normal r.p.m. During practice autorotations, maintain the r.p.m. in the green arc with the throttle while lowering collective. Once the collective is fully lowered, reduce engine r.p.m. by decreasing the throttle. This causes a split of the engine and rotor r.p.m. needles. A straight-in autorotation implies an autorotation from altitude with no turns. The speed at touchdown and the resulting ground run depends on the rate and amount of flare. The greater the degree of flare and the longer it is held, the slower the touchdown speed and the shorter the ground run. The slower the speed desired at touchdown, the more accurate the timing and speed of the flare must be, especially in helicopters with low inertia rotor systems. Refer to figure (position 1). From level flight at the manufacturer’s recommended airspeed, between 500 to 700 feet AGL, and heading into the wind, smoothly, but firmly lower the collective pitch control to the full down position, maintaining r.p.m. in the green arc with throttle. Coordinate the collective movement with proper antitorque pedal for trim, and apply aft cyclic control to maintain proper airspeed. Once the collective is fully lowered, decrease throttle to ensure a clean split of the needles. After splitting the needles, readjust the throttle to keep engine r.p.m. above normal idling speed, but not high enough to cause rejoining of the needles. The manufacturer often recommends the proper r.p.m. At position 2, adjust attitude with cyclic control to obtain the manufacturer’s recommended autorotation or best gliding speed. Adjust collective pitch control, as necessary, to maintain rotor r.p.m. in the green arc. Aft cyclic movements cause an increase in rotor r.p.m., which is then controlled by a small increase in collective pitch control. Avoid a large collective pitch increase, which results in a rapid decay of rotor r.p.m., and leads to “chasing the r.p.m.” Avoid looking straight down in front of the aircraft. Continually cross-check attitude, trim, rotor r.p.m., and airspeed. 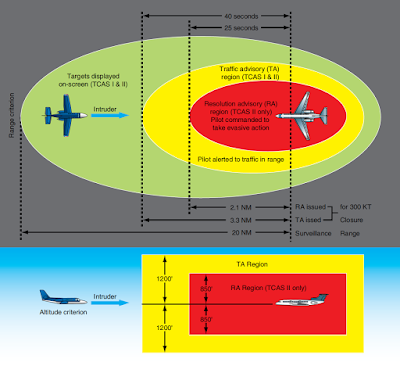 At approximately 40 to 100 feet above the surface, or at the altitude recommended by the manufacturer (position 3), begin the flare with aft cyclic control to reduce forward airspeed and decrease the rate of descent. Maintain heading with the antitorque pedals. Care must be taken in the execution of the flare so that the cyclic control is not moved rearward so abruptly as to cause the helicopter to climb, nor should it be moved so slowly as to not arrest the descent, which may allow the helicopter to settle so rapidly that the tail rotor strikes the ground. 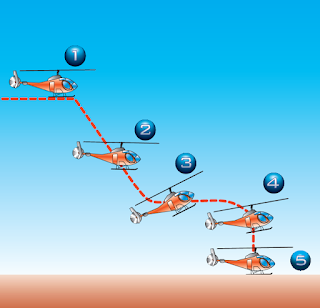 When forward motion decreases to the desired groundspeed, which is usually the slowest possible speed (position 4), move the cyclic control forward to place the helicopter in the proper attitude for landing. The altitude at this time should be approximately 8 to 15 feet AGL, depending on the altitude recommended by the manufacturer. Extreme caution should be used to avoid an excessive nose high and tail low attitude below 10 feet. At this point, if a full touchdown landing is to be made, allow the helicopter to descend vertically (position 5). Increase collective pitch, as necessary, to check the descent and cushion the landing. Additional antitorque pedal is required to maintain heading as collective pitch is raised due to the reduction in rotor r.p.m. and the resulting reduced effect of the tail rotor. Touch down in a level flight attitude. A power recovery can be made during training in lieu of a full touchdown landing. Refer to the section on power recoveries for the correct technique. After touchdown and after the helicopter has come to a complete stop, lower the collective pitch to the fulldown position. Do not try to stop the forward ground run with aft cyclic, as the main rotor blades can strike the tail boom. Rather, by lowering the collective slightly during the ground run, more weight is placed on the undercarriage, slowing the helicopter. Failing to use sufficient antitorque pedal when power is reduced. Lowering the nose too abruptly when power is reduced, thus placing the helicopter in a dive. Failing to maintain proper rotor r.p.m. during the descent. Application of up-collective pitch at an excessive altitude resulting in a hard landing, loss of heading control, and possible damage to the tail rotor and to the main rotor blade stops. Failing to level the helicopter. A power recovery is used to terminate practice autorotations at a point prior to actual touchdown. After the power recovery, a landing can be made or a go-around initiated. At approximately 8 to 15 feet above the ground, depending upon the helicopter being used, begin to level the helicopter with forward cyclic control. Avoid excessive nose high, tail low attitude below 10 feet. Just prior to achieving level attitude, with the nose still slightly up, coordinate upward collective pitch control with an increase in the throttle to join the needles at operating r.p.m. The throttle and collective pitch must be coordinated properly. If the throttle is increased too fast or too much, an engine overspeed can occur; if throttle is increased too slowly or too little in proportion to the increase in collective pitch, a loss of rotor r.p.m. results. Use sufficient collective pitch to stop the descent and coordinate proper antitorque pedal pressure to maintain heading. When a landing is to be made following the power recovery, bring the helicopter to a hover at normal hovering altitude and then descend to a landing. If a go-around is to be made, the cyclic control should be moved forward to resume forward flight. In transitioning from a practice autorotation to a go-around, exercise care to avoid an altitude-airspeed combination that would place the helicopter in an unsafe area of its height-velocity diagram. Initiating recovery too late, requiring a rapid application of controls, resulting in overcontrolling. Failing to obtain and maintain a level attitude near the surface. Failing to coordinate throttle and collective pitch properly, resulting in either an engine overspeed or a loss of r.p.m. A turn, or a series of turns, can be made during an autorotation in order to land into the wind or avoid obstacles. The turn is usually made early so that the remainder of the autorotation is the same as a straight in autorotation. The most common types are 90° and 180° autorotations. The technique below describes a 180° autorotation. Establish the aircraft on downwind at recommended airspeed at 700 feet AGL, parallel to the touchdown area. In a no wind or headwind condition, establish the ground track approximately 200 feet away from the touchdown point. If a strong crosswind exists, it will be necessary to move your downwind leg closer or farther out. When abeam the intended touchdown point, reduce collective, and then split the needles. Apply proper antitorque pedal and cyclic to maintain proper attitude. Cross check attitude, trim, rotor r.p.m., and airspeed. After the descent and airspeed is established, roll into a 180° turn. For training, you should initially roll into a bank of a least 30°, but no more than 40°. Check your airspeed and rotor r.p.m. Throughout the turn, it is important to maintain the proper airspeed and keep the aircraft in trim. Changes in the aircraft’s attitude and the angle of bank cause a corresponding change in rotor r.p.m. Adjust the collective, as necessary, in the turn to maintain rotor r.p.m. in the green arc. At the 90° point, check the progress of your turn by glancing toward your landing area. Plan the second 90 degrees of turn to roll out on the centerline. If you are too close, decrease the bank angle; if too far out, increase the bank angle. Keep the helicopter in trim with antitorque pedals. The turn should be completed and the helicopter aligned with the intended touchdown area prior to passing through 100 feet AGL. If the collective pitch was increased to control the r.p.m., it may have to be lowered on roll out to prevent a decay in r.p.m. Make an immediate power recovery if the aircraft is not aligned with the touchdown point, and if the rotor r.p.m. and/or airspeed is not within proper limits. From this point, complete the procedure as if it were a straight-in autorotation. Power failures in a hover, also called hovering autorotations, are practiced so that you automatically make the correct response when confronted with engine stoppage or certain other emergencies while hovering. To practice hovering autorotations, establish a normal hovering altitude for the particular helicopter being used, considering load and atmospheric conditions. Keep the helicopter headed into the wind and hold maximum allowable r.p.m. To simulate a power failure, firmly roll the throttle into the spring loaded override position, if applicable. This disengages the driving force of the engine from the rotor, thus eliminating torque effect. As the throttle is closed, apply proper antitorque pedal to maintain heading. Usually, a slight amount of right cyclic control is necessary to keep the helicopter from drifting to the left, to compensate for the loss of tail rotor thrust. However, use cyclic control, as required, to ensure a vertical descent and a level attitude. Leave the collective pitch where it is on entry. Helicopters with low inertia rotor systems will begin to settle immediately. Keep a level attitude and ensure a vertical descent with cyclic control while maintaining heading with the pedals. At approximately 1 foot above the surface, apply upward collective pitch control, as necessary, to slow the descent and cushion the landing. Usually the full amount of collective pitch is required. As upward collective pitch control is applied, the throttle has to be held in the closed position to prevent the rotor from re-engaging. Helicopters with high inertia rotor systems will maintain altitude momentarily after the throttle is closed. Then, as the rotor r.p.m. decreases, the helicopter starts to settle. When the helicopter has settled to approximately 1 foot above the surface, apply upward collective pitch control while holding the throttle in the closed position to slow the descent and cushion the landing. The timing of collective pitch control application, and the rate at which it is applied, depends upon the particular helicopter being used, its gross weight, and the existing atmospheric conditions. Cyclic control is used to maintain a level attitude and to ensure a vertical descent. Maintain heading with antitorque pedals. When the weight of the helicopter is entirely on the kids, cease the application of upward collective. When the helicopter has come to a complete stop, lower the collective pitch to the full down position. The timing of the collective pitch is a most important consideration. If it is applied too soon, the remaining r.p.m. may not be sufficient to make a soft landing. On the other hand, if collective pitch control is applied too late, surface contact may be made before sufficient blade pitch is available to cushion the landing. Failing to use sufficient proper antitorque pedal when power is reduced. Failing to stop all sideward or backward movement prior to touchdown. Failing to apply up-collective pitch properly, resulting in a hard touchdown. Failing to touch down in a level attitude. Not rolling the throttle completely to idle.